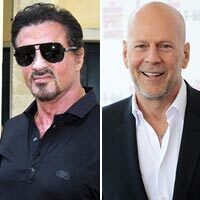 Burly, thick-featured and balding, Bruce Willis looks as if he would be perfectly at home behind the wheel of an 18-wheeler. 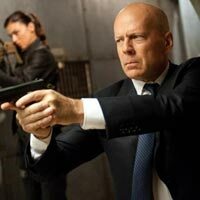 Instead, he is one of Hollywood's more popular action heroes, thanks in part to the success of the "Die Hard" series. But to peg Willis into such a narrow category is to deny his versatility, for he has proven himself at home in lead and supporting roles in dramas, comedies, romances and adventures. Though he was born on an American military base in West Germany on March 19, 1955, Willis was raised in New Jersey from the age of two. As a youth, Willis had a stammer that only disappeared when he was performing, something he continued to do during high school as the class clown. He had less to laugh about after his participation in a racial incident during his senior year got him expelled until his father hired a lawyer and Willis was allowed to graduate. After his graduation, Willis worked several odd jobs and played the harmonica for a local blues band by the name of Loose Goose. While attending Montclair State College, he performed in a production of Tennessee Williams' Cat on a Hot Tin Roof, and his love of acting blossomed. He spent much time in New York trying out for various off-Broadway productions, finally succeeding in 1977. He left school to work in the play Heaven on Earth, but his subsequent acting career was spotty, with a commercial here and a small theatrical role there. However, in 1984 he landed the lead in an off-Broadway production of Fool for Love and then, during a trip to Los Angeles, was selected out of 3,000 auditioners to co-star in Cybill Shepherd's romantic sitcom Moonlighting as the egotistical, self-assured private detective David Addison. Though the show experienced troubled behind the scenes, in large part due to a long-running conflict between Willis, Shepherd and the show's creator Glenn Gordon Caron, it was a major hit during most of its 1985-89 run. In the early '80s, Willis had bit parts in two major features, but did not make his official big screen debut until he starred opposite Kim Basinger in the Blake Edwards farce Blind Date (1987). He again worked with Edwards for his sophomore effort playing cowboy star Tom Mix opposite James Garner's Wyatt Earp in the western spoof Sunset (1988). Both films reaped modest profits, but did little in the way of making Willis a major star. Then came Die Hard (1989), in which Willis played a low-key New York cop who ingeniously takes on a group of international terrorists who have taken hostage the corporate L.A. office where his estranged wife is attending a Christmas party. The movie was slick, fast-paced and filled with amazing stunts. Its tremendous popularity put Willis on Hollywood's A-list, and naturally suggested that Willis would have followed up his success with another blockbuster, but he instead appeared in Norman Jewison's drama In Country as a psychologically damaged Vietnam vet who must care for his orphaned niece. Willis next lent his vocal talents to the voice of the baby in the inventive comedy Look Who's Talking (1989) and its sequel Look Who's Talking Too (1990). He went on to reprise his role as a cop in both "Die Hard" sequels. In 1991, he made his screenwriting debut for the much panned Hudson Hawk. Since then, his film career has continued to be prolific but uneven, with lows such as The Color of Night (1994) and Four Rooms (1995) and highs such as Pulp Fiction (1994) and 12 Monkeys (1995). In 1998, Willis' reputation as an action hero was reinforced with the big-budget, big-box office Armageddon, but following this success, Willis opted for a smaller project, this time in the form of the long-delayed production of Kurt Vonnegut's Breakfast of Champions (1999). 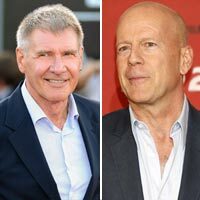 Bruce Willis Is Bored Of Action Movies!